Although there may be many happy times in life, one of the saddest times that we will ever experience is when one of our family members dies. It sometimes maybe a distant relative but when it is a mother or a father, the pain can cut very deep. We may even spend years getting over the grief but sometimes, we might find that a little bit of laughter helps us to deal with the situation in the best way we possibly can. In fact, you may even find that laughter is the best medicine when it comes to grieving. This was seen in The Hamilton Spectator recently when an obituary was published. It was for a woman named Sybil Marie Hicks, and although you probably have never heard of her before, you are about to know her quite intimately. The obituary was written from her perspective but it was her children who actually wrote down the words. When you read down through it, you can’t help but notice how good of a life she probably had and judging by what her children did, it seems as if she was quite loved as well. Humor is always something that you would want to keep fast hold of, regardless of what your age is or the situation you may be experiencing in life. 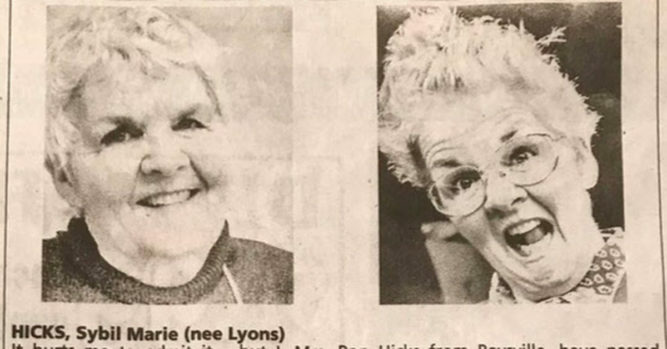 The humor behind this obituary will make you laugh and it will also make you appreciate a woman that you never knew before. Twitter fell in love with her story. Her story was featured on a CBC radio show. Her son talked about homemade soup on the interview. A flood of emotion poured out in the replies. What a beautiful person and great Canadian. Making people laugh despite your own suffering is a wonderful, selfless gift to those you leave behind. Seems like your mom was a hoot and just a great person to be around. May she live on in your heart.